Welcome, I have some gut shots of the Top Tone Light Drive (thanks to one kind person). I believe this is a Pete Cornish SS-2 without an input buffer. I have traced the pedal and I can post the schematic but I'm not 100% sure and only a few values (don't remember which) are read from the gut shots. I don't have the pedal unfortunately, only gut shots. Last edited by MWichni on 04 Feb 2012, 12:19, edited 1 time in total. Looks very much like two cascaded RAT's to me, am I right? sinner wrote: Looks very much like two cascaded RAT's to me, am I right? Totally not. If I traced it properly it is a Distortion + with added tonestack and second gain stage. ah finally, thanks very much! I asked them and they gave me the hint in the direction of the Dist.+ with something added after that. Ghandi wrote: ah finally, thanks very much! Are you sure R11 is connected to 9V? Would make more sense to be connected to Vb. I find it odd that he used 2 LM741s instead of an LM1458 or JRC4558. Would've made for a more compact layout. From what I see on the last picture where I marked +9V and GND rails r11 is connected to +9V. But as I wrote earlier it would be great if someone could check the schematic and values. 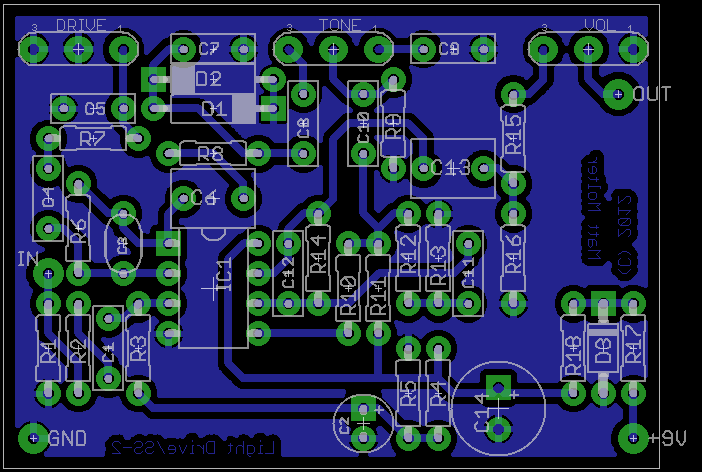 Did up the schem and a quick single sided 1590B sized layout in Eagle. Part numbering matches that of the schem in post 1. Only difference is that the two LM741s have been replaced with a single dual op amp. mmolteratx wrote: Are you sure R11 is connected to 9V? Would make more sense to be connected to Vb. I'll try to go through the schem and the pics later this evening if I find the time. that 50K drive pot gives a max op-amp gain with R7 being only 470ohm of 212 and it is also reverse log and that is perfect. C5 across the drive pot is a difference to a normal distortion+ and would give some high end boost if the drive pot is turned down and bypassed by the cap giving the higher frequencies more gain and presence, pretty cleaver as a stock distortion+ sound pretty muddy at low gain settings. The Tone pot also looks good. One question do I understand it correct that you only used the pics to make that schematic? and the pic from the pcb side with some values given and some unknown, has that the same part numbering as the schematic? I cant make out many values from the pics, how did you do that? Values marked on the picture is read from the pictures. I had some resistor color codes read down by the owner and from that I made my guesses. Hope it helps. And yes I traced it only from the pictures. I can't confirme the schematic. There are too many connections were I can't make out if it's a resistor or capacitor and what value they have. Don't compare parts numbering from schematic to the layout because they are not the same. I'm sure that D1 and D? are clipping diodes because this make sense, right? If you will trace this from what I drawn and from the pictures you will come close to the schematic I ended up I think. but there are a few parts totally under the goop where it's impossible to tell what values they have, caps and resistors. Unfortunately I can't tell that too. I think that for the dist+ part of the layout it is 741 and for the recovery stage it could be 741 or TL071. The biggest problem is to determine resistors and capacitors values in the recovery stage as there is no way to read them. But dist+ and tonestack values are rather sensible and some of them were read from the pictures. MWichni wrote: Unfortunately I can't tell that too. I think that for the dist+ part of the layout it is 741 and for the recovery stage it could be 741 or TL071. The biggest problem is to determine resistors and capacitors values in the recovery stage as there is no way to read them. But dist+ and tonestack values are rather sensible and some of them were read from the pictures. The 1M coming from the junction of the two 10k resistors would bias the first op-amp input OK. The two 1M bias divider resistors can't be used with a 10µ capacitor as drawn - the time constant would mean that the bias would drift up towards 4V5 over several seconds! It seems to be a pretty crude design (in common with a lot of this guy's circuits - usually built on the basis of "what you don't put it can't go wrong"!). The use of a pair of 741 op-amps is probably in an effort to use the limited bandwidth of this IC type.b The problem will be that it will be noisy (the 741 really hisses badly by modern standards!). Thanks for the reply but if you trace the schematic from the picture I'm sure that you will get the same schematic that I get. This is why I'm thinking about the values of the parts instead of chaning the schem. But maybe I'm wrong so I'm asking about confirmation. Hope it's not too much. Thanks in advance. Here's a vero for it, currently unverified but I've checked it through a few times. I've used a series protection diode, but you can always alter it if you want it as per the original, or omit it entirely if you don't want the small voltage drop. Last edited by IvIark on 11 Feb 2012, 15:28, edited 1 time in total.